Lazy river, waterslides, playground! This waterpark has everything kids would want. Your family gets plenty of elbow room in these large rentals. Let your kids play in the zero-entry pool while you sip on a sweet tea. Kick off your shoes and jump into a game of beach volleyball with family and friends. Right across from the beach and next door to the Midway Par 3 Golf Course, the sixteen-acre Holiday Inn Club Vacations Myrtle Beach-South Beach is situated at the quieter southern end of Myrtle Beach. You’re also a nice stroll away from the natural beauty of Myrtle Beach State Park. This resort will make a great jumping off point for families or groups who want to hit the links, explore the beauty of the Grand Strand or go for a swim at the swanky outdoor pool. The little ones will have a blast on the waterslide. Enjoy a relaxing float down the lazy river or grab a drink from the poolside bar and catch up on the book you picked up in the airport gift shop. When the kids get hungry, head to the bbq grills for a cookout. Now the only question is: burgers or hot dogs? After lunch, challenge the family to a game on the sand volleyball court. Let the kids participate in the resort’s children’s activities (Monday through Friday) or hang out in the game room while you get in a workout at the fitness center. Studio condos sleep four guests and have kitchenettes which allow you to prepare the basics. One- to two-bedroom condos sleep four to six guests. Full kitchens have what you need to make everything from microwave pizza to a four-course meal. It’s just a short drive to Food Lion grocery store, take the family along to make sure that nothing important is forgotten. When you return to your condo, declare it taco night and let everyone go crazy. Don’t worry if things get messy, one- and two-bedroom condos have in-suite washer/dryers. While the laundry is going, put in a movie for the kids to watch on the flatscreen TV; it has cable and a DVD player. Let the kids each bring a few favorite movies from home. 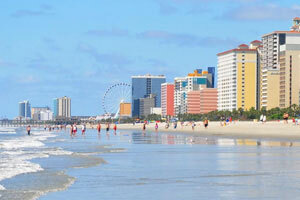 Holiday Inn Club Vacations Myrtle Beach-South Beach has a free area shuttle. Family Kingdom Amusement Park feature over thirty-five family, kid and thrill rides. Rides include a train, bumper cars, rollercoasters and a ferris wheel. Go for a ride on the SkyWheel and enjoy the best views of Myrtle Beach. It’s almost two-hundred-feet tall and the climate-controlled gondolas ensure everyone in the family will be comfortable. Broadway at the Beach features a variety of shops and restaurants that everyone in the family will love. Let the kids each build their own stuffed animal at Build a Bear. Pick a Pearl lets you create your own unique piece of jewelry. Bring home a gift for your four-legged family member from Reigning Cats & Dogs. Celebrate the holidays year-round at Christmas at the Beach; they feature holiday decor. Hungry? Try Joe’s Crab Shack, Hard Rock Cafe or Dave & Busters. HOUSEKEEPING Housekeeping Service Schedule Is Upon Departure Only.